Poking around the internet this weekend, I discovered that Wired’s GeekDad blog did a nice news blurb about Up Up Down Down Left WRITE and the Kickstarter. Super psyched! With only 12 days left to the Kickstarter and approx $5,200 left to raise, this is a nice little boost! Getting close to the home stretch, which is when I’ll really need any interested folks who’ve been considering backing it to step up to the plate and kick out the backer jams – uh yeah, mixed metaphors. Anyway! You can read the Wired piece here on GeekDad. 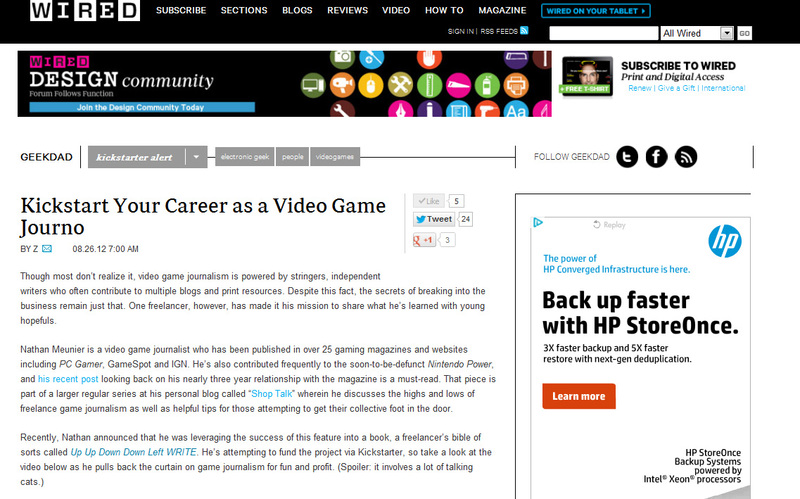 This entry was posted in Up Up Down Down Left WRITE and tagged freelance, freelancing, game journalism, game journo book, geekdad, how to, how to be a game journalist, kickstarter, nathan meunier, wired, writing by nmeunier. Bookmark the permalink.